Stomach acid plays a vital role in your body. Anti-reflux medications essentially turn off the production of acid in your stomach, potentially throwing off the natural balance of your body. As the list of side effects linked to these drugs continues to grow in length and severity, it is important to understand the risks and take control of your treatment options. Since their introduction to the market in the 1980’s, proton pump inhibitors (PPIs) have become the mainstay of acid reflux treatment. Due to their long-term side effects, FDA guidelines state that PPI medications (OTC) should only be used for 14-days, 3x a year. That’s it. Many patients have been taking these medications for years, even decades. How long have you been taking PPIs? 44% increased risk of dementia and Alzheimer’s disease in patients over 75 years of age with a slightly higher risk to men over women1. 20% increased risk of heart attacks among all adult PPI users, in addition to a 2x greater risk of PPI users suffering from a major adverse cardiovascular event vs. non-users2. 46% increased risk of developing chronic kidney disease (CKD) for those taking twice-daily PPIs as compared to a 15% increased risk for once daily users3. 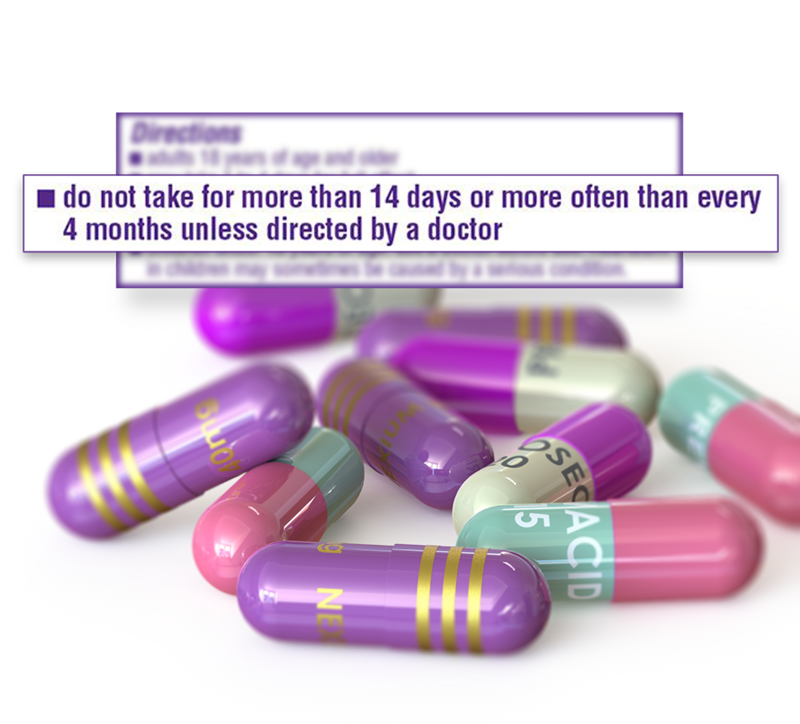 2x increased risk of suffering from a hip, wrist or spine fracture in patients over 50 years of age with the greatest risk being for those who take high doses of PPIs for one year or longer4. 42% increased risk of developing community-acquired pneumonia with greater risks associated with those patients taking higher dosages of PPIs5. 3x increased risk of developing Clostridium difficile, a serious intestinal bacterial infection causing chronic diarrhea and often requiring long-term treatment with antibiotics6. 1. Gomm W, von Holt K, Thomé F, et al. Association of Proton Pump Inhibitors With Risk of Dementia: A Pharmacoepidemiological Claims Data Analysis. JAMA Neurol. Published online February 15, 2016. doi:10.1001/jamaneurol.2015.4791. 2. Shah NH, LePenduP, Bauer-Mehren A, GhebremariamYT, Iyer SV, et al. (2015) Proton Pump Inhibitor Usage and the Risk of Myocardial Infarction in the General Population. PLoS ONE 10(6): e0124653. doi: 10.1371/journal.pone.0124653. 3. Lazarus B, Chen Y, Wilson FP, et al. Proton Pump Inhibitor Use and the Risk of Chronic Kidney Disease. JAMA Intern Med. 2016;176(2):238-246. doi:10.1001/jamainternmed.2015.7193. 5. Laheij RF, SturkenboomMM, Hassing R, Dieleman J, Stricker BC, Jansen JJ. Risk of Community-Acquired Pneumonia and Use of Gastric Acid–Suppressive Drugs. JAMA. 2004;292(16):1955-1960. doi:10.1001/jama.292.16.1955. The information on this site is not intended or implied to be a substitute for professional medical advice, diagnosis or treatment. All content, including text, graphics, images and information, contained on or available through this site is for general information purposes only. Amenity Health makes no representation and assumes no responsibility for the accuracy of information contained on or available through this site, and such information is subject to change without notice. You are encouraged to confirm any information obtained from or through this site with other sources, and review all information regarding any medical condition or treatment with your physician. Never disregard professional medical advice or delay seeking medical treatment because of something you have read on or accessed through the sites. Amenity Health does not recommend, endorse or make any representation about the efficacy, appropriateness or suitability of any specific tests, products, procedures, treatments, services, opinions, health care providers or other information that may be contained on or available through this site. Amenity Health is neither responsible nor liable for any advice, course of treatment, diagnosis or any other information, services or products that you obtain through this site.